The toughest of all audiences but also home to some of our best work, making shows for kids is telly at it’s purest and in our case silliest. ​In a post-truth world where facts and scientific knowledge are no longer valued, an elite group of 8 year olds are chosen to attend the most high-flying science school in the universe - Brain Freeze High! Can these young cadets earn their scientific stripes and reclaim the truth before it’s too late? Brain Freeze High is a STEM-based, mixed media comedy series focusing on Media Literacy, produced by Kite Entertainment and Turnip & Duck, with development co-funded by the Creative Europe Media programme of the European Union. The series was pitched at the 2017 Cartoon Forum in Toulouse, and development is ongoing. For more information, please see the microsite www.brainfreezehigh.com. Science Fiction’s big brother Brain Freeze uses the same blend of puppets and animation to create a world where science facts meet big laughs. Each episode sees our heroes, Dr. Sorcha Knowles and Prof. Mike McCork, answer the day's BIG QUESTION and explain the science behind their BIG ANSWER. It¹s all done under the ever-stressed and panic-stricken eye of Colin, the show's guinea pig floor manager. 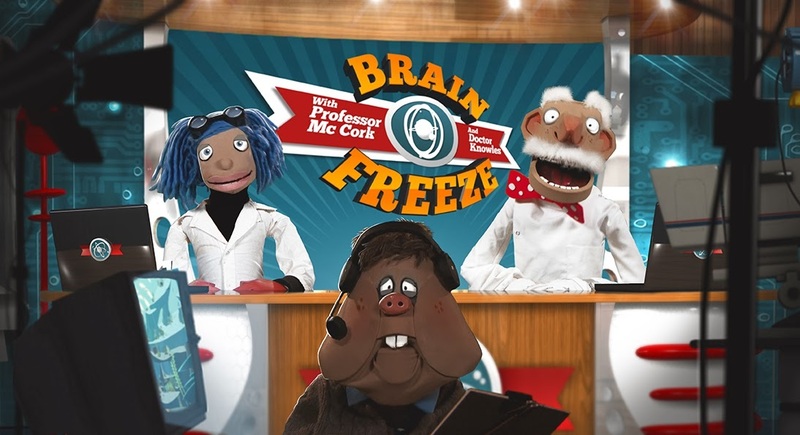 Brain Freeze airs on CBBC and is distributed internationally by Aardman Rights. 90 second shorts that use a mixture of puppetry, animation and top notch comedy writing to explain a variety of science facts. Three 13 part series produced, two for RTE Jnr and one for CBBC/RTE Jnr. International rights with Aardman Rights, sold to Discovery Asia, Finish TV, Israel and France.